The Senate debate on Iraq grew sharper Thursday when Majority Leader Harry Reid said the war had been lost and that President Bush's troop buildup is not stemming the rampant violence. That statement prompted Republicans to declare that Democrats do not support the troops in Iraq. "I believe myself that the secretary of state, secretary of defense and — you have to make your own decisions as to what the president knows — (know) this war is lost and the surge is not accomplishing anything as indicated by the extreme violence in Iraq yesterday," said Reid. The White House called Reid's remarks "disturbing" and a slap at troops who are risking their lives. Senior Republican Senator and White House hopeful John McCain also lashed out Thursday at Reid's comments. At a news conference before a fund-raiser at a Las Vegas casino, McCain blasted the Nevada senator, saying his comments would hurt troop morale. 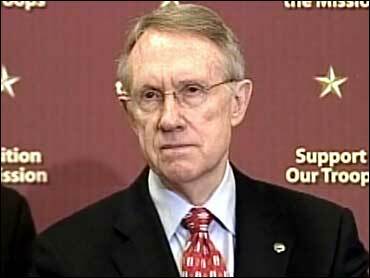 "It seems to me Sen. Reid has lost all sense of priority," he said. White House spokeswoman Dana Perino says if Reid has the courage of his convictions, he'll try to cut off all war funding. Democrats who lack the votes for that appear set to send President Bush a war-funding measure with a non-binding timeline for pulling out the troops. Bush still intends to veto it. The president is scheduled to go to Michigan Friday to again speak out for a war-funding bill with no strings attached. Anti-war liberals in the House are reluctant to mount opposition to war spending legislation even if it does not set a firm date for troop withdrawal. Their support would pave the way for Democratic leaders next week to send President Bush a bill that would fund the Iraq war and still call for troops to leave by March 31, 2008, albeit a nonbinding withdrawal date. The measure would be weaker than House Democrats wanted but is advocated by the Senate, where Democrats hold a slimmer majority and many party members oppose setting a firm timetable on the war. Rather than let the bill sink, "we want to get it to the president and let him veto it," said Rep. Diane Watson, a Democratic Party liberal who opposes funding the war at all. Bush has promised to veto any bill that sets a timetable on the Iraq war, contending that decisions on troop deployments must be left to the commander in chief and military commanders on the ground. His position raises the bigger question of what Democrats will do after the veto. The quiet support of a House-Senate compromise among the rank-and-file represents a new tack by Democrats who say they want to pull together in their fight against Bush on the war. Rep. Hank Johnson, a first-term Democrat who represents a district in Georgia that is strongly opposed to the war, said lending his support to a bill that funds the war without setting a firm end date will be difficult. On the other hand, he added, Democrats might be in a tougher spot if they cannot pull the caucus long enough to act against Bush. "We have to look at the political realities of being the party that's in control, and prove the American people we can govern," he said. Last month, Watson was one of several liberal Democrats who threatened to block passage of the House bill because she did not think the measure went far enough to end the war. Watson and Democratic Reps. Lynn Woolsey, Barbara Lee and Maxine Waters said they refused to fund the war and wanted language that would end combat before the end of 2007. House Speaker Nancy Pelosi launched an aggressive whip operation to persuade members the bill was their best shot at trying to force Bush to abandon his Iraq policy. Eventually, the group said they would help round up support for the bill despite their intention to personally vote against it. The bill passed narrowly, mostly along party lines, in a 218-212 vote. House appropriators are now trying to negotiate a final bill that could be sent to the president by next week. With Senate leaders nervous the final bill would fail if it included a firm deadline, aides said Democrats were leaning toward accepting the Senate's nonbinding goal. The compromise bill also is expected to retain House provisions preventing military units from being worn out by excessive combat deployments; however, the president could waive these standards if he states so publicly. On Thursday, Pelosi summoned Woolsey, Lee, Waters and several other of the party's more liberal members to her office to discuss the issue. According to aides and members, concerns were expressed but there were no loud objections to a conference bill that would adopt the Senate's nonbinding goal. Watson said she would personally oppose the final bill, as she did last month, but would not stand in Pelosi's way if the speaker agrees to the Senate version. "It's still a timeline," she said. "We're not backing down from that."